It starts with a simple idea: massive cubes of clay, half a meter high. 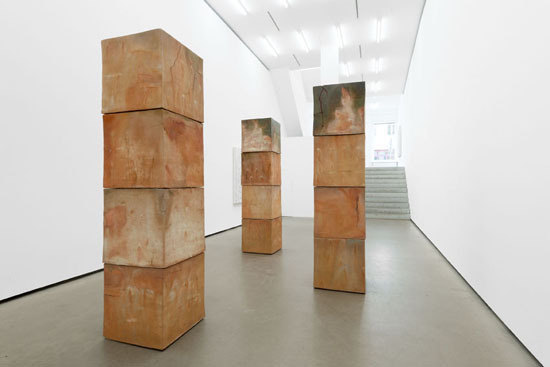 Bosco Sodi's new sculptures, cubes of fired clay stacked in high columns, on view from 7 July to 27 August in the Berlin gallery EIGEN + ART, shouldn't function at all in these dimensions. They ought to have exploded while being fired; too great is the force of extreme heat that is released in the material – sand, earth, and water. Bosco Sodi refused to be dissuaded and began his experiment. In his studio on the Pacific coast of Mexico, he worked for several months creating the cubes, from preparing and compounding the material through layering and forming to drying and firing them. He experimented with various fuels, like coconut shells and wood, and observed the effects on the form, surface, and color. Even the kiln in which the cubes were fired for 24 hours was built especially for this purpose from clay bricks, using the method people have used for several thousand years when working with ceramics. In the end stands the ideal form: a symmetrical cube with six equal sides, something that doesn't exist in nature and that only humans can produce, but made entirely of organic materials, produced through the interaction of all four elements. Each cube bears the traces of the work process, some with more and some with fewer fissures, the corners slightly warped, the hues shimmering, depending on what material was used in the firing process. Each cube tells the story of its creation. By piling the cubes to columns in the exhibition, Bosco Sodi lets them approach the form and proportions of the human body and at the same time creates an architecture reduced to the essential, a colonnade through which one can move. Viewed up close, the columns develop a power that is hard to capture in words and that one can experience, but not hold fast. As if one could feel the forces required to produce them, the rawness, naturalness, heat, mass, and the sheer weight they consist of. At the core of Bosco Sodi's work is always the process, the trying out and arriving at a result whose appearance he may influence, but not foresee. Sodi leaves as much as he can thereby to coincidences or even accidents; he veritably seeks the uncontrollable. The artist determines the framework and the material, but the finished work arises through processes that take their own path. The same holds true in his pictures, which grow into three dimensions, which he usually produces in colored series. 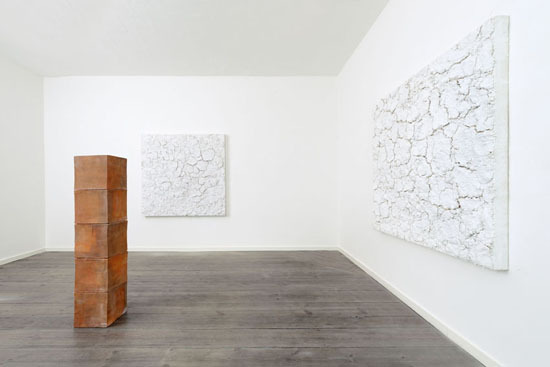 Their surfaces develop furrows when he layers sawdust, glue, cellulose, and pure pigment on canvases and then lets them dry under the influence of local temperature and humidity conditions; Sodi has several studios in New York, Mexico, and Barcelona. But the quality of the water and the consistency of the sawdust let the pictures develop differently in accordance with the site. His work on the pictures ends the moment when, after days of forming, drying, and processing, the first cracks appear on the surfaces. Then the pictures develop a life of their own, changing in color and in the forms that develop on the surface. Even if all the pictures in the new series of titanium white squares have the same format and were made with the same material under the same climatic conditions, none is like another, each can be read differently and arouses different associations and memories when one's gaze opens up to them. Often these are memories of natural phenomena and formations like lush green rain forests, gleaming blue surfaces of seas, or shocking pink blossoms that build up in one's head when one views the pictures, and the sight of these pictures is as overwhelming and gripping as the sight of the vastness of the sea, the mountains, or forests. The new white series is like a dry desert, like the soil hungering for rain: earthy, thirsty, perhaps also icy. Here, too, the energy seething under the surface is downright graspable. 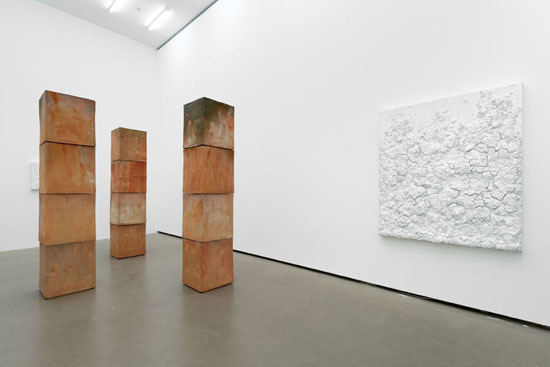 Bosco Sodi's work is closely interwoven with the Japanese concept of wabi sabi. In this aesthetic philosophy, beauty does not lie in external glamor, but in the "imperfect", in simplicity, the patina, and the fine cracks in the surface of a perfect picture.